If you're looking for Rockies game lineups and you don't feel like searching all over Twitter or waiting for MLB.com to post them, check back to Heaven & Helton about 60-90 minutes before first pitch and they should be here waiting for you. Let's dig right into these lineups. Pretty disappointing that Jim Tracy gives the Opening Day nod to Jose Lopez over Jonathan Herrera. Herrera earned the right to be in this lineup based on his play last season, in the Winter League, and then during the spring. It's not a huge deal or anything, it's just disappointing. Hopefully Jose Lopez rewards the manager's faith with a good afternoon. Rockies catch their first break of the year with Stephen Drew unable to go. Ubaldo Jimenez is set up for a very, very strong first start in the 2011 season. The Rockies have come back to Coors Field! Finally... 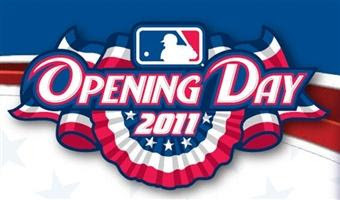 Opening Day 2011 has arrived. First Pitch in FOUR hours!